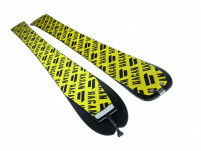 The Y-Flow ski was so popular in Europe that Hagan decided to make it a series and add three more widths. This is despite having to awkwardly write “[wai]” in the product name to ensure native German speakers pronounce it like an English “Y”. The Y-Boost is a wider version of the Flow with a 97mm waist, putting it more in the sweet spot of the North American market where powder is abundant. Hagan stiffened the tail, added a carbon tip stabilizer, and instituted a new color scheme for the series. The geometry remains the same, with a big floaty tip and a narrower tail to keep it nimble. We still rank it as the most versatile design around, now with multiple widths to choose from for a true one-ski quiver. New carbon tip stabilizer smooths the ride by reducing shovel vibration. Diamond shaped ABS sidewall offers great edge hold and impact protection. Elliptical shovel offers float akin to much wider skis, letting you charge in pow. Carbon layers sandwiched around a Paulownia core is key for lightweight stability. Relatively narrow 113mm tail and a 19mm turn radius make the Boost nimble. Optional matching skins are a precut mohair/nylon blend. This my go to ski. I have skied it for two seasons in a lot of different conditions. They are perfect in any kind of powder conditions and honestly I have never felt the need for bigger ski. I feel like they can go fast and feel stable. In more difficult snow conditions, they are easy to turn and forgiving. I've skied them in steep terrain and plenty of difficult conditions. They've done very well. I have these paired with TLT 6P's and I generally ski them without the tongues. If the conditions are rough, I may put the tongues, if I remembered to bring them. I got to ski this at the SIA on snow demo at copper for a few runs. Let me tell you, it skis fantastic! It managed chopped up crud like a boss, was super playful and fun without being squirly at all. And all that while demoing a new pair of boots on which the ski mode didn't work properly. If you are in the market for a midfat general purpose ski, I wouldn't hesitate to choose these.